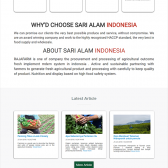 SARI ALAM INDONESIA is one of company the procurement and processing of agricultural outcome fresh implement mdern system in indonesia . Active and sustainable partnering with farmers to generate fresh agricultural product and processing with carefully to keep quality of product. Nutrition and display based on high food safety system.